The United States has announced that it will contribute 12 million dollars to the Slovenian International Trust Fund for Demining and Mine Victims Assistance. The United States has announced that it will contribute 12 million dollars to the Slovenian International Trust Fund for Demining and Mine Victims Assistance, or ITF. The funds will provide dollar-for-dollar matching grants to other public and private donor's contributions, in effect doubling ITF funding for mine clearance, survivor assistance, mine-risk education, and related programs in the Balkans. The International Trust Fund was established by Slovenia in 1998 with the aim of helping Bosnia and Herzegovina in its mine clearance and mine victim assistance efforts. Due to the success of its operations in Bosnia and Herzegovina, ITF has expanded its efforts to Albania, Croatia, Macedonia, Montenegro and Serbia. ITF seeks public and private donors for mine action related activities. The United States has provided more than 138 million dollars to the ITF to help safely clear more than 92 million square meters of land and provide services to more than one-thousand individuals through this unique funding method. "Through ITF," said U.S. Deputy Assistant Secretary for Political Military Affairs Thomas Masiello, "Slovenia plays a special role as a steward of the international community's efforts and donations for mine action in the region. We are pleased to contribute and through our matching funds, encourage others to do so as well." The United States has also partnered with ITF, the International Committee of the Red Cross, and the Israeli government to provide medical evaluation and treatment for children from Gaza injured by landmines and explosive remnants of war during the winter of 2008-2009. 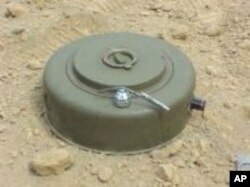 The United States is the world's single largest financial supporter of humanitarian mine action. Since 1993, the U.S. has partnered with 63 partner organizations like the International Trust Fund to deliver more than 1.5 billion dollars toward landmine clearance and conventional weapons destruction in 47 countries.